Convenient and reliable activity tracking for rodents. Photobeam-based open field chambers provided in partnership with San Diego Instruments enable high-throughput activity and anxiety testing. 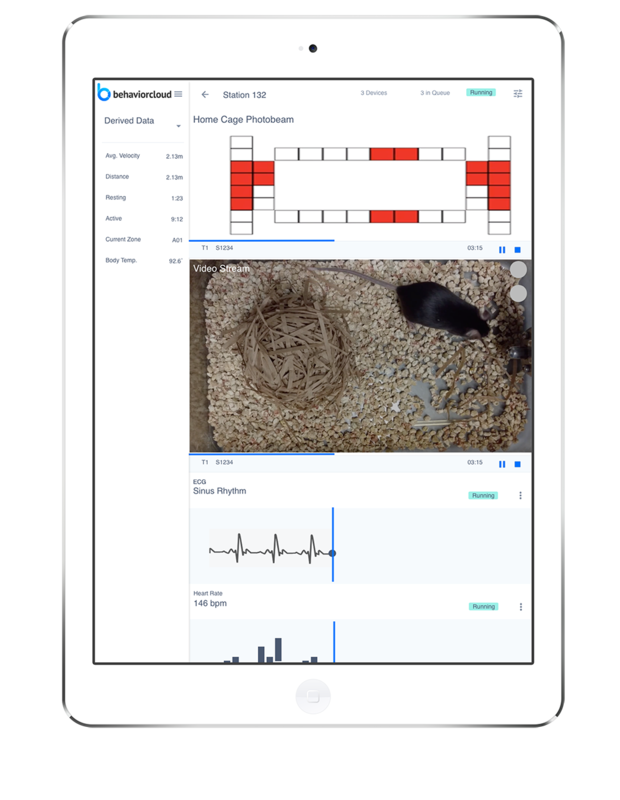 Stream XY position data from multiple chambers directly to your BehaviorCloud account for downstream analysis of ambulatory vs. resting time, zone entries, rearing, and more. Home cage photobeam systems from San Diego Instruments enable long-term activity measurements of many subjects in parallel. Great for studying circadian activity rhythms and more. 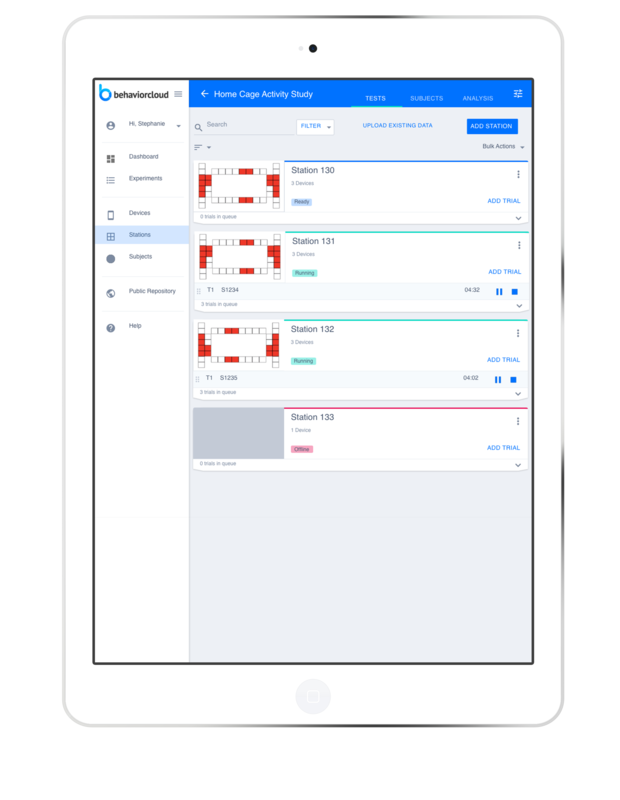 Control your photobeam systems remotely through your BehaviorCloud account and preview the data in real-time from anywhere there's internet. Connecting a BehaviorCloud Bridge to your SDI photobeam activity system transforms it into a modern, cloud-connected data streaming machine. No extra software needed. Now you can control experiments and receive data in real-time through your BehaviorCloud account. Configure experiment settings and start or stop trials using your computer or mobile device. All the controls you need in the palm of your hand. You can even check in on long-term photobeam experiments from your phone, without even setting foot in the lab. From raw XY beam-breaks to analyzed ambulatory vs. resting time, rearing counts, zone-based measures, and more. All of your downstream analysis tools are accessible from within your BehaviorCloud account, available anywhere there's internet access. You can also invite colleagues to view or contribute to experiments. Configure 32 photobeam chambers or more for simultaneous data collection from many subjects in parallel. Complete your study in record time. Connect additional data streams, including video and implanted telemetry sensors, for collecting many complementary data points all at once. Sign up for an account and get started today. Start now by signing up for a free account. Upload or stream data, analyze, and collaborate with others. 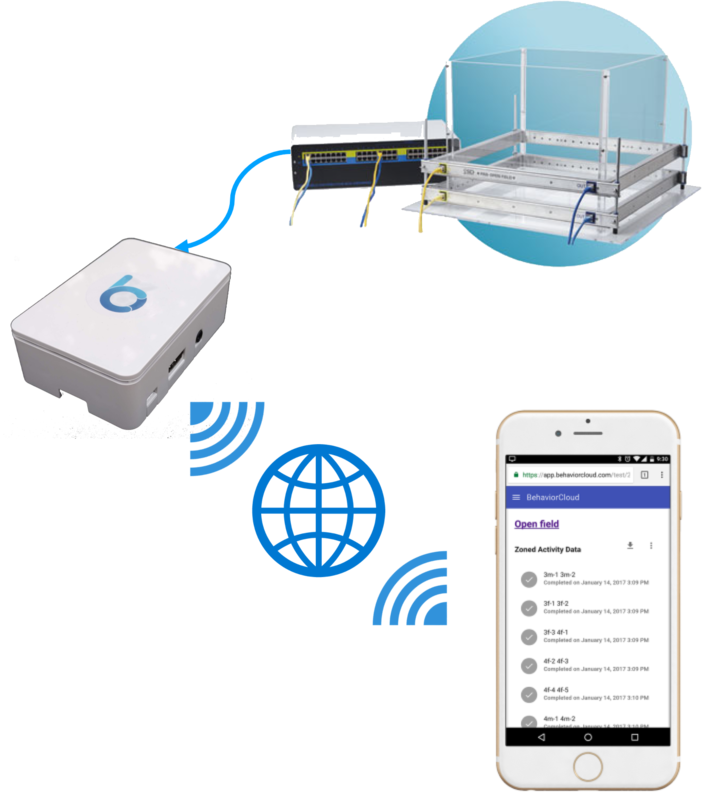 You will need San Diego Instrument's Photobeam Activity System for home cage or open field, depending on your intended use. Connect a Bridge to your photobeam system to begin streaming data to BehaviorCloud immediately.